The Labrador has a variety of inbred attributes which make it an ideal service dog. Its genial nature, responsiveness to training, and retrieving abilities are invaluable in assisting the disabled, while its gundog’s nose has been well employed in scent trailing for search and rescue or detection roles. Labrador Retrievers and Labrador cross – breeds are the most popular dogs for assisting the blind. The largest guide – dog training centres breed their own stock. Puppies live in volunteers’ homes, where they receive basic training and are exposed to a range of learning scenarios. 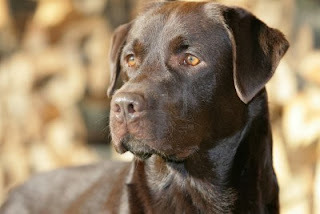 The Labrador’s medium size, eagerness to please, receptiveness to training, and, above all, its steady temperament make it ideal for assistance work. In breeding programmes, dogs are selectively bred fro a calm, sensible attitude in unusual situations, ensuring a low drop – out rate – less than 30 per cent – during the subsequent months of formal training at regional guide – dog centres. Since guide dogs and owners typically share their lives for eight to nine years, it is important that their personalities are compatible. Training – centre staff initially assess the relationship during a period of residential instruction, where both dog and prospective owner learn to understand each other. After the pair have “graduated”, specialized staff makes home visits to ensure that the partnership is working well. As natural retrievers, Labradors enjoy carrying objects and can easily be trained to fetch common household items, to help the infirm or disabled. Dogs with particularly gregarious characters can act as ears for deaf people, alerting their owners to important sounds, such as a doorbell ringing or a baby crying. Sometimes, young guide dogs that prove too active for the role are retained as “hearing” dogs. A Labrador can be taught to meet the specific needs of its disabled owner – to pull a wheelchair along, pick up dropped items, open certain types of door stand and push life buttons, or even to open clothes dryers and take out the washing! All these activities provide physical and mental stimulation for the well – trained dog. An added bonus is that a disabled person will often be acknowledged and approached much more readily when accompanied by a friendly canine assistant. In earthquakes and avalanches, search and rescue Labrador trained to follow air and ground scent trails perform well. Many also help to locate people lost in mountainous regions. The first cave – probing search and rescue dog was a Labrador, who successfully navigated a labyrinth of subterranean passageways to lead a stranded party to safety. The breed’s scent – detecting roles have extended to work with police forces, tracking illicit drugs. Labradors have also been employed in Scandinavia to uncover mould in timber yards, and in the United Kingdom to reveal rising damp in homes.